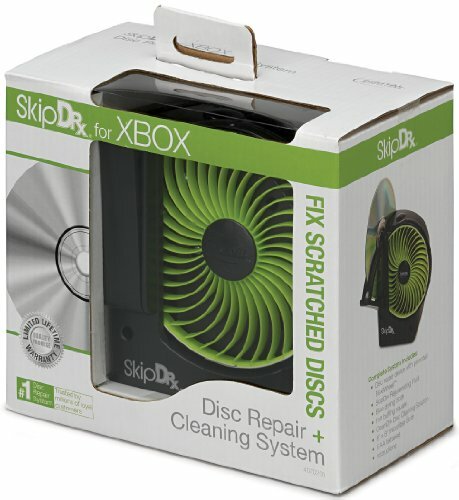 SkipDr for XBOX Disc Repair + Cleaning System is recognized throughout the industry as the smartest solution to repairing and cleaning XBOX discs. The patented FlexiWheel with its unique microfrictional surface uniformly repairs damaged XBOX discs without losing data. The #1 Disc Repair System fixes scratches that cause an XBOX disc to skip freeze and fail to play. Motorized repair process smoothes surface scratches to renew the disc's protective layer leaving disc data unaffected. Patented FlexiWheel repairs up to 25 discs and works gently enough to safely repair the same disc multiple times. Includes: Disc repair device with patented FlexiWheel SkipDr Rejuvenating Fluid blue drying cloth felt buffing square CleanDr Disc Cleaning Solution 8" x 8" microfiber cloth 6 AA batteries and instructions. This item cannot be shipped to APO/FPO addresses. Please accept our apologies.